Oh dear me no: horrible auto, only 5 speeds in manual, too expensive in anything but the base model. The Bambino, a classic of the late 50’s, was built for nearly 20 years with scarcely a change. It’s cute-as-a-button face made all who saw it fall madly and passionately in love. It was difficult to get yourself into too much strife because a car the size of a tissue box only had a 500cc motor and cross-ply razor blades for wheels. By the end of the run the engine had increase hugely in capacity to a massive 600cc. So, it was hardly a fireball. In the last decade or so car makers have come over all broody and sentimental and they’ve re-imagined some of their old classics. Mini and the Beetle come to mind and I like both very much. They are cute and comfortable. They have air conditioning, electric windows, and brakes and steering more 12st century guided missile than 14th century cattle dray. Then came Fiat with the cutsie pie 500 and what a little darling it is. It isn’t without fault but is none the less a brilliant little thing. If you hold your head just right, it looks rather muscular. It may look similar to the 50’s original but thankfully it grew in stature. The original was so perfect because it was cheap to buy, cheap to run, and easy to park, but it was far to snug inside. 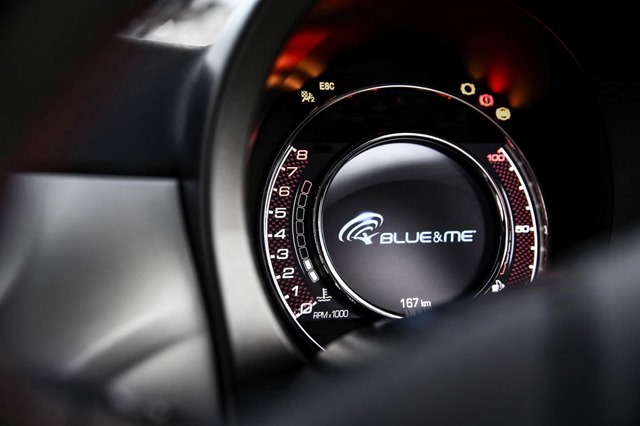 Including on-roads, the 500 range starts at a sensible $17,000 rising to, wait for it, a stratospheric $65,344 for something rather hopefully, and somewhat inappropriately called the Edizione Maserati Convertible. It is only comes in an “automatic” transmission. I say “automatic” because the gearbox is in fact a rather awful robotized manual instead of the 5 speed in the other models or a more conventional automatic gearbox. Who is going to buy it? 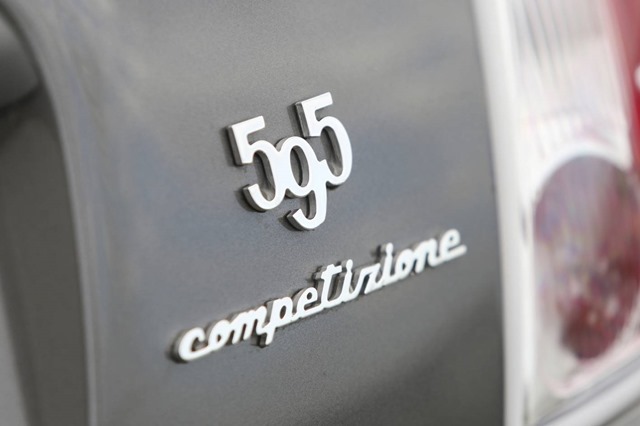 Our test car was Fiat’s Abarth 595 Competizione, and costs $42,859 on the road in NSW. and for that price you have the right to expect everything to be tickety boo, and on the outside they are. The standard body sits on 17” wheels through which the Stop-Fast red brake calipers and cross-drilled discs can be seen. The metallic grey looks slightly menacing and the Abarth decals scream “look at me”. 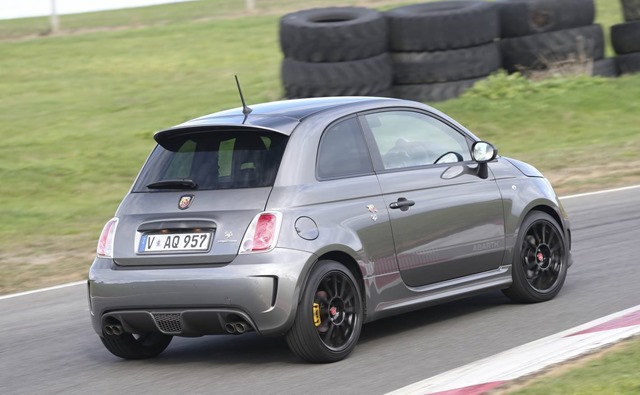 7.5 seconds to a hundred is reasonably quick but in this price range the 500 Abarth is up against stiff competition in the Golf GTi, and is far more expensive than Renault’s Clio RS. Both of these are quicker, roomier, and have more equipment. The 1.4L turbo drives the front wheels so there is a torque steer by the bucketload. The ride has been sacrificed for better cornering. To a degree it works. In tight bends at speed you have to keep your wits about you. Hitting bumps mid corner causes alarming jumpiness. It is ok for a short ride but is a bit wearing on the nerves after a longer spell in the saddle. There is smarter ways to get great handling than removing any semblance of comfort. 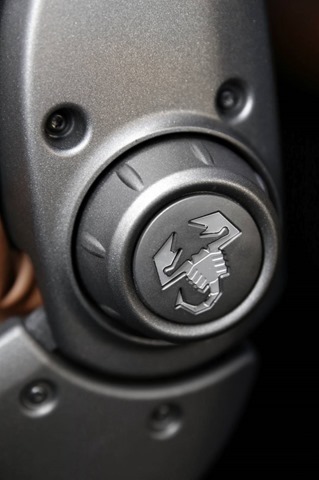 Do not under any circumstances go anywhere near the aforementioned diabolical pretend automatic. It’s a dreadful single clutch robotized manual gear box that’s slower than a wet week and twice as annoying. 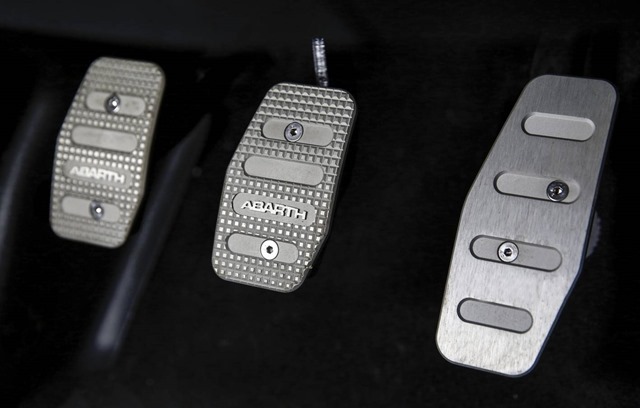 Putting your foot down on the go pedal elicits motion as normal until you come to a gear shift whereupon the passengers lurch forward as the robot under the bonnet presses the clutch. An unfortunate amount of time passes before the next gear is selected and the robot leisurely re-engages the clutch. A human operating a conventional manual is far more efficient and much less annoying. Disappointingly, the manual is a 5 speed which is one speed behind the industry standard 6 speed. The dual mode exhaust has the most glorious noise. It is the best thing about the experience. There is a fair amount of understeer and of course the torque steer under heavy acceleration. The base models have a nice ride which is soft and smooth. The seats are reasonably cosy but there is still the problem of the handle on the centre console bin. The handle sticks out so that a tall driver with his foot on the foot rest spends his time with his leg pressed tightly against it. It leaves a mark and on a long trip is incredibly annoying. Yes, the shape is as cute as can be and yes, the nod to the past brings us all to a misty sniffle into a lace hanky but it is all just that, a memory of halcyon days long gone. 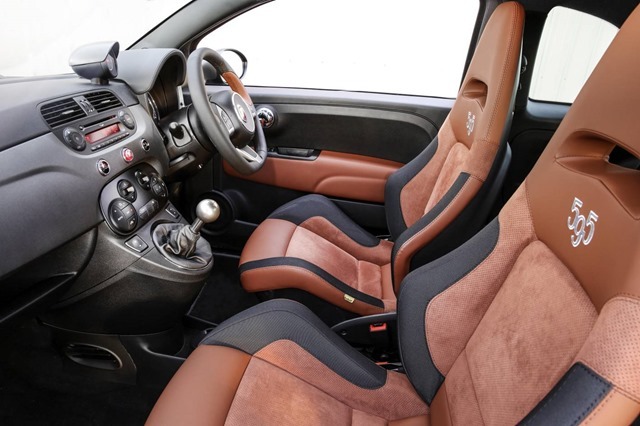 The interior is delicious with a mixture of textures, fabrics and leather. I’m not sure how much of the leather came from an actual cow but it is the look which matters. 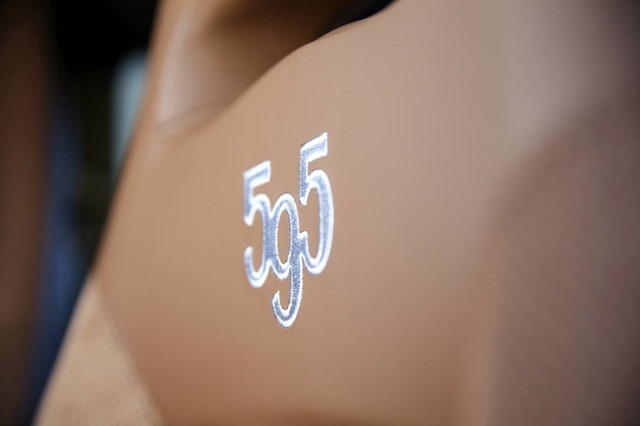 There is tasteful embroidery on the head rests and a short sports-shift gear lever. There is no central LCD screen from which you choose a tasteful array musical accompaniments for your journey. It would be easy to install a generous touch screen so that the entertainment system didn’t feel and look so basic. For this money it is reasonable to expect more. The sound is adequate but nothing special. By far, the most annoying thing is that any time you get a phone call or restart the car, the radio changes stations to KIISfm. Whoever missed that little oversight should be bitchslapped. Also, there is no satnav. 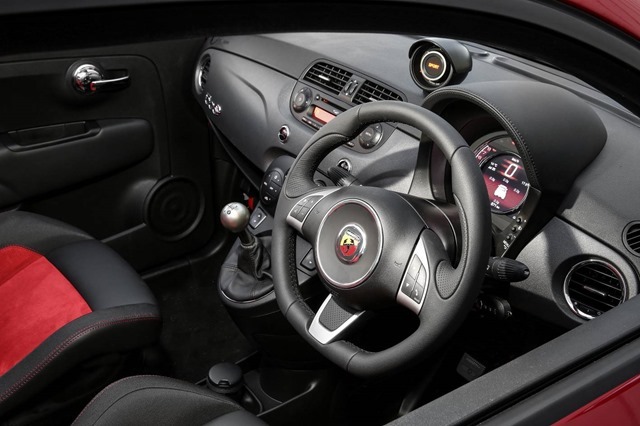 Satnav is an add-on unit in the base models which in the Abarth is replaced by a rather unnecessary turbo boost gauge. I’d rather know where I’m going thanks very much. The climate control works well and is a welcome addition. It is more the norm than the exception these days but the Cruise Control is AWOL. How is that possible? Even a base model Kia allows you to rest your tired feet on a long trip. This is probably the one car on the market which makes the buying decision a difficult question to answer. You see it isn’t as straight forward as comparing what you get for your money. If you were to do that no one would buy it. The 500 has an indefinable something. It isn’t a wannabe pastiche trying to get noticed in a schoolyard, it is the real deal. But have we moved on? Unlike the original which only had a base model, the current range has many models to choose from. None is equipped as modern cars should be. As fun and as cute as it is I just can’t see this being your only car. Apart from the other cars I’ve mentioned, you could get yourself a fabulous Ford Fiesta ST. It is $12,00 cheaper, faster, has more power, more standard equipment, more room, and drives better. The question you’d have to ask yourself is do you want form over function and are you prepared to pay for it. I like the 500 very much but it isn’t everything it could be. I might feel differently were it 10k cheaper, but it isn’t. I enjoy driving it but kept reaching for the phantom 6th gear. The radio changing stations drove me potty and the absence of SatNav is a problem. I could cope with the snug cabin and rough ride if it wasn’t for the other offerings. The market is chockers with a cornucopia of delicious titbits. I get the impression the Abarth tried to create a niche for itself and failed. 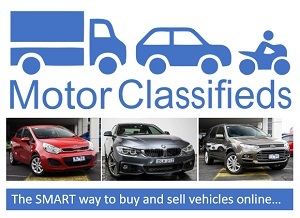 The base models aren’t bad value and are worth considering but even they are aimed at a premium buyer. 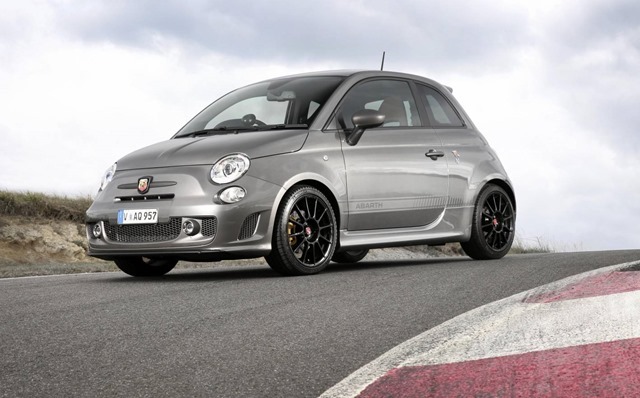 The premium buyer could spend a little extra over the Abarth for a BMW. 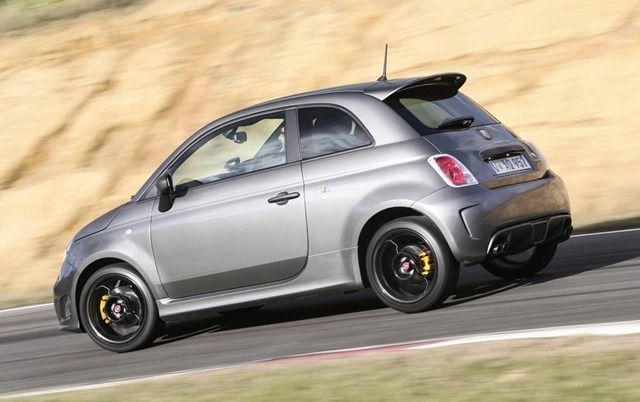 The top Abarth is the same price as an EVO X (now discontinued) or WRX STi. There is just no way on earth any sane person is going to buy a Fiat 500 of any kind over a Lancer EVO or Subaru WRX. The top 500s are priced to sell in a market segment they can’t possibly compete in. The answer once would have been yes but there are far too many alternatives out there which have more gear, are better drives, and are far cheaper. I love it I really do but I just don’t want to own one. No, I’m afraid I’d buy a Fiesta ST and hire the occasional 500 if I fancied being different. Grosse promotion: A protecting matter iPhone 6 skilled to Armed forces Standard € 11.